Ever wondered how “SAINT” Valentines Day started??? Well we did and now we know. The Roman Catholic Church inserted the “saint” part as they were unable to abolish the pagan celebration from its members. This ancient celebration probably pre-dated the founding of Rome. Some scholars believe it started around 753 BC right around when Rome was founded and other scholars believe a little before that. There are a couple different celebrations that were being held during this same time. Lupercalia (fertility and purification and sexual license festival) has some pretty morbid roots. It pre-dates Rome but the Catholic Church eventually adopted it and changed the date to Feb 14th. In 494-496 by way of Pope Gelasius I the church was told to let go of the celebration and its celebration essentially ended. Some argue it wasn’t until the late 5th Century that is was abolished by Felix III. The sacrificing of animals ended in 341 A.D. as instructed by Rome. The following text outlines the basics behind this festival. Celebrated at the ides of February, or February 15, Lupercalia was a fertility festival dedicated to Faunus, the Roman god of agriculture, as well as to the Roman founders Romulus and Remus. 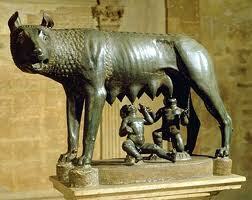 Romulus and Remus were supposedly raised in a cave and nursed by a wolf. To begin the festival, members of the Luperci, an order of Roman priests would sacrifice two male goats and a dog. Next, two young patrician Luperci were led to the altar, to be anointed on their foreheads with the sacrificial blood, which was wiped off the bloody knife with wool soaked in milk, after which they were expected to smile and laugh. The sacrificial feast followed, after which the Luperci cut thongs from the skins of the victims, which were called februa (where February comes from which means to purify in Latin) dressed themselves in the skins of the sacrificed goats, in imitation of Lupercus, and ran round the walls of the old Palatine city, the line of which was marked with stones, with the thongs in their hands in two bands, striking the people who crowded near. Girls and young women would line up on their route to receive lashes from these whips. This was supposed to ensure fertility, prevent sterility in women and ease the pains of childbirth. The Valentines Day celebrated today is much different than that of Lupercalia. We know that Lupercalia was banned around the 5th Century. We also know that Valentines Day has nothing to do with the sacrificing of animals for another god in today’s society. In today’s society we have been far removed from the origins of this celebration. We are told to never celebrate anything in the same way as the pagans celebrated their gods. While this celebration has nothing to do with our Elohim, it has pagan roots in which they worshipped their gods.